From last many years Khoj is working on many social public Art projects in and around Khirkee village which brought many significant changes in local community. 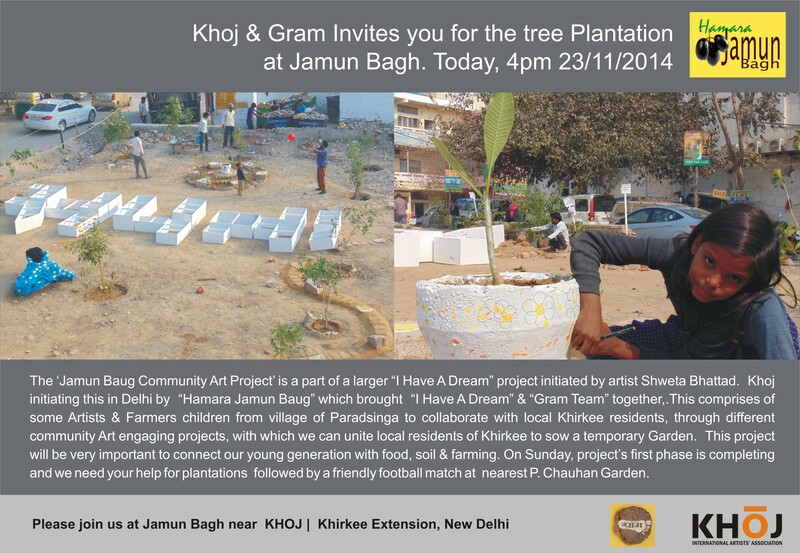 Khoj always wanted that Artists should get involved with local communities and Humara Jamun Bagh is outcome of such community Art initiative taken by Khoj. The ‘Humara Jamun Baug Community Art Project’ is a part of a larger “I Have A Dream” project initiated by artist Shweta Bhattad. In this project the artist invites other Artists, Farmers, social organizations from around the world to choose a land in their own countries to sow the seeds or native crops in form of “I Have A Dream” in their own local language and take aerial images of it. This is a two year long project from 2014-2016. At present there are 27 countries who are participating. Shweta Bhattad is also the founder of “Gram Art Project”, ”Gram” aims to work in rural India, on different important issues related to village, through community based national & International Art Projects. Gram is focusing more on creating the network between the local rural community and artists, social inventors, experts around the world in various streams to initiate the dialogue which can lead to healthy relationships and create opportunity for both the sides, to explore various aspects and act on it in a collaborative way with sustainable approach. Gram believe that this collective act by like minded people, and community based art practices by collaborating with concern people from around the globe to think and act on a particular thought or concern can be the major aspect which leads to awareness, social-cultural-economic innovation and can be a great catalyst for change. The “Jamun Baug Community Art Project” will bring together “I Have A Dream” & “Gram Team” which comprises of some Artists & Farmers children from village of Paradsinga to collaborate with local Khirkee residents, through different community Art engaging projects, with which we can unite local residents of Khirkee to sow a temporary Garden. This project will be very important to connect our young generation with food, soil & farming. Post by Gram Art Project. November 23, 2014 in Art Residency, Farmer Exchange.